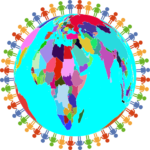 We hope you can use this forum to help collaborate with teachers and parents from around the world. Let's make global education part of the standard, together! You can also interact with our authors, illustrator and team through this forum. If there are any questions about this forum, please feel free to send us an email. PLEASE NOTE: Child safety is our primary concern here at Joy Sun Bear. To that end, this forum is for parents and educators only. All participants must be over the age 18. We welcome parents and educators to post messages from their kids/students to communicate with us through their account. By registering for the Forum, you will be subscribed to our newsletter and gain access to our free coloring activities. Email addresses submitted for the forum/newsletter are used ONLY for the that purpose (which may include promotions, updates and links) and will NOT be sold to any third-party, ever. You may unsubscribe at any time. Thank you. Visit our Global Education Resources page to explore other resourceful websites. Want to Use our resources at home or in the classroom? Visit our Global Classroom Engagement page to learn how you can use our global education and character development resources in your home or classroom.